Opa never told me about his drawings. I found one in a box with a stack of his and Oma’s old photographs. A small rectangle of cardstock – measuring about 6″ x 2 1/4.” Drawn in ink, perhaps with a fountain pen. My mother had written on the back…identifying it as Opa’s handiwork. Who are these people? I recognized two names: “Hank” is Opa and “Ruth” is Oma. The details make me smile. Cowlicks. Curly hair. Twelve friends holding hands and grinning. Each person just a bit different from the next. Whimsical and sweet and young and happy. And then I found these photos tucked in with the drawing. I can match two of them…Hank and Ruth are second from the right. The rest – I can only guess; although “Andy” in the tank top could be a close bet on the far left. Oma was 19 and Opa was 20 years old in September, 1926; as I imagine most of these young people probably were too. Were they all childhood friends? I have no idea. All the photos tell me is they were enjoying the day and each other. Celebrating a day off from work together. How Opa & Oma loved their friends! They traveled with them. Exchanged letters for many years. Went out to eat. Visited both near and far. Opa went on numerous hunting and fishing trips with his buddies. Oma went along on at least one hunting trip that I know of, but I think the black flies put an end to that. They traveled to Florida for deep sea fishing trips with lifelong friends. They both made friends most everywhere they went. Opa was an open, gregarious man who relished the art of conversation. Oma was a bit quieter, but ever present with a twinkle in her eye and a sly comeback. Opa traveled in Europe quite often in the 1940’s and 1950’s for business. He once struck up a conversation with a man sitting next to him on a long distance train in Switzerland. Opa’s soon-to-be new friend happened to have twin daughters who were the same age as his daughter (my mother). The twins became penpals with my mother and eventually emigrated to the United States a decade later. Fast forward to my childhood — they became like family and shared many holiday celebrations with us. One twin became my sister’s godmother. I am still close friends with the surviving elderly sister, who now lives back in Switzerland. Look what a chance meeting on a train led to. I wonder what happened to my grandparents’ friends after this Labor Day in 1926. Their friends from before marriage and children and, in a few years, the Great Depression. When everything changed. I am glad they had each other…The Whole darn Bunch. My Opa and Oma grew up in Cincinnati, Ohio. I was aware of that from a very early age. We traveled many miles by car and by train to visit various relatives there when I was young. It’s where my parents grew up too. Baseball meant the Cincinnati Reds – Opa’s favorite team. Both my brothers wore the requisite Reds baseball hats and jackets, even though we all lived on the east coast. Oma sometimes reminisced about the sales job she held (until she married) at the Wurlitzer Company in downtown Cincinnati. I remember stories about riding streetcars and shopping at Kroger’s. Opa and Oma were very proud of their childhood beginnings…and the schools they went to. I’m not sure if they attended the same grammar schools. I wish I had asked more questions about their earliest years. Opa did mention some hijinks involving a piano in the music room which I won’t go into here; but suffice it to say he was a prankster. And proud of it. Which doesn’t surprise me at all. The class pictures I found – some over 100 years old – make me wonder…what happened to all those children? What were their lives like? What were their stories? Below is Opa’s kindergarten class (he is identified by the arrow). I wonder how long those 5 year olds had to stand or sit still for the photographer. First or last day of school? Was that one class or 2 together? What a group…all those hats! Below is (what I assume to be) Oma’s Kindergarten class. Unfortunately this photo has deteriorated and there is no mention of what school it was (although I suspect it might be the Kirby Road School – it seems similar to her 8th grade location in the next photo). She is 4th from the right in the second row (black mark pointing her out). Oma told me how much she loved the big bows she wore in her hair as a child. Next is Oma’s 8th grade class photo. There she is in the front row, still wearing a big bow in her hair. She went to the Kirby Road School, which is now listed on the “National Register of Historic Places” in Cincinnati, Ohio. It has been (or is planning to be) converted into apartments – 50,000 square feet of them; most complete with original chalkboards and wood floors & trim! I can just imagine her reaction to hearing that news. Perhaps a sly grin and a shake of the head…. Another Kirby Road School class picture is in the form of a postcard. It is not dated, but appears to be 1914 or 1915 judging from how old the children look. Oma would have been in the 3rd or 4th grade; still wearing the bow, but not looking too pleased this time. 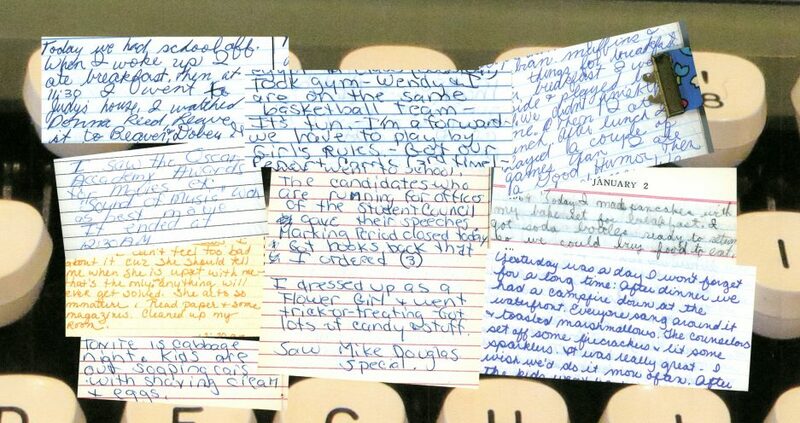 She had written the note on the back of the postcard, shown below. Kirby Road School – circa 1914 – 1915? Opa’s grammar school class – not sure exactly which grade. Look at all the children carefully posed at their desks. Holding books open as if the photographer was interrupting a reading lesson. Library books are listed on the blackboard, so perhaps that explains the reason for the photo…promoting library books? Something new for the school? The flag draped on one desk – which seems odd, but there may have been some tie-in to the book theme. They all look so serious…except Opa sitting in the back with a big grin on his face. He was smart, funny, strong-willed but fair. As a child, that’s how I knew him. He could also be difficult, abrupt and demanding. But never with me. More on that in the future as well… His sense of humor bordered on the – shall we say – inappropriate at times, but I always loved feeling like I was in on the joke. He died over 25 years ago and I miss him still. He left me with so many unique memories – along with his letters, home movies and photographs. So many stories!